My grandson Odin had a thing for helicopters for awhile. He called them "Wop Wops". How hard could it be to make a helicopter for a little boy. 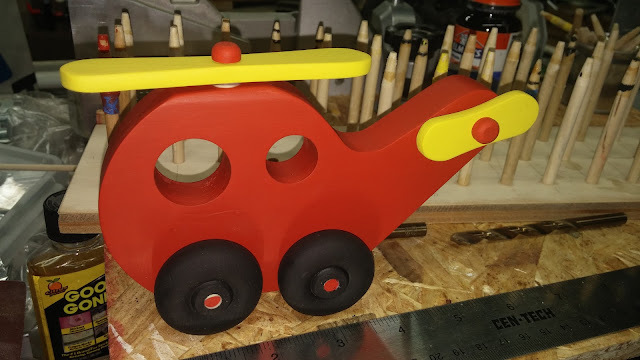 I sketched a helicopter body on a board and started cutting and drilling. The only hard hard was was making the rotors. I created several rotor patterns on paper before I got the proportions right. I cut the body from a piece of spruce I had left over from a long ago project. The rotors are made fom some thin hardwood I already had so no resawing was required. I tend to keep every piece of wood the looks big enough to be useful. I was a bit skeptical about the strength of the rotors, but he has been playing with it for two years and they are still intact. I don't know how but he did manage to get the peg out of the top rotor. This was an easy repair. The paint is all acrylic craft paint some of which I have had for years. Three coats of red, two coats of black, and lot of coats of yellow. If I had it to do again I would have put on a base coat of white but eve without it the colors looked good. The little helicopter came out so well that I made a template from it in case I want to make some more. After two years of use it barely shows some wear.